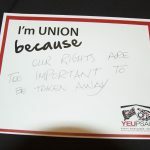 “I’m Union Because” is a campaign we launched at this weekend’s YEU Triennial Convention. Delegates shared a few thoughts on what motivates them to keep their union alive, what being Union means to them. We hope you enjoy the pictures & take a moment to think about what makes YOU Union. Want to add your voice? Print off the pdf, post it on your Union Billboard at work. It’s a conversation we need to have with our co-workers, our kids, our friends and neighbours. There’s a lot of talk out there about what Unions are, what they do… if we don’t tell our own story, we give away all our power. Tell your story! Download the pdf, print it off and post it!